Battery management board details for 2nd Generation Large Lithium Rechargeable Batteries with High Current and High Capacity. Due to limited resources we cannot accept new customers for these cells, sorry. Second generation lithium-ion Large Lithium-ion cells and Batteries are now available with higher currents, and longer life. Block Diagram of the Battery Management Board Showing Connections. In this case it is a 10 cell board. These battery management boards are used for our li-ion batteries that not only have high capacity, but can deliver high power. One 12 AH, 3.7 volt cell can supply 130 watts, a 4 cell pack can supply over 500 watts at 12 volts. High-power lithium ion batteries are now a reality. They can be used as storage cells or power sources. The LDB21060A-VI is over-charge/discharge protection board for lithium-ion rechargeable batteries in series. It features an over-charge/over-discharge threshold for the battery cell voltage during charging/discharging process, and also provides on-time protection when excess current or short circuit occurs. The boards produced so far are approximately 20 mm x 80 mm x 60 mm. They are typically attached to the side of the battery pack. 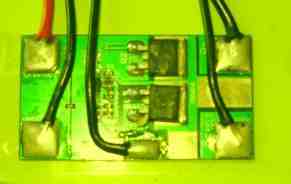 The battery management board is essential to maintain a safe, long lived battery pack. They have the following functions. 1. Balance charging current among the cells in the pack to insure all cells are fully and evenly charged. 2. Protect the cells in the pack from overcharge. 3. Protect cells from overcurrent. 4. Protect the pack from short circuits. 5. Protect the cells in the pack from overdischarge. For more details of these battery management boards see the chart below, or click here. *** Battery management board for any combination of series and parallel cells are readily available with 3-5 week lead time. State of the art lithium-ion cell with laser welded stainless steel cases, no polymer, rubber, or plastic seals. Cells under development or available from 3AH to 60 AH. Priced competitive with other battery chemistries.